Click HERE to watch the video of this cake! Ten years ago when I was working in the corporate world, I came across something that made me really start daydreaming about a tropical vacation. One of my friends had sent out an email with a picture of a hut on stilts in Tahiti, over the most beautiful clear water I had ever seen. I stared at that picture for the longest time, and I told my husband that it would be great if we could go to a place like that sometime. Maybe one day that wish will come true. In the meantime though, I decided to make a cake to look like it. With every single cake that I have made, there’s always been some sort of learning experience. Whether it’s just a small thing, or a big, “Oh man, I should’ve done that instead of this,” circumstance, there’s always something to be learned with each cake. Well, this particular cake had several learning experiences…and luckily this cake was just made for the heck of it, so it didn’t even have a home. Good thing! First thing’s first…the little hut. I made this several days before making the cake. The floor and walls are made out of gumpaste, and I used a pattern press to give it the wood texture. The windows and door frame are individually cut out, and they were laid down to set and harden before putting up together. The roof is made out of rice krispie treats piled on top of a cake board, then covered with icing and fondant. The dock is made out of the same material, color and pattern press as the hut. Now, on to the accessories… The bed is one rice krispie treat, covered with icing and fondant. 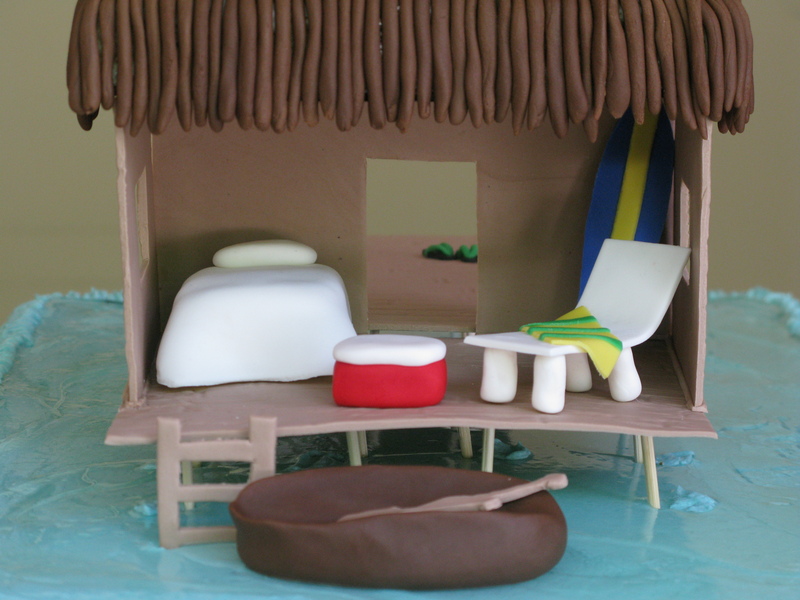 The surfboard is fondant, the lounge chair is gumpaste. The towel and beer cooler are made out of fondant. 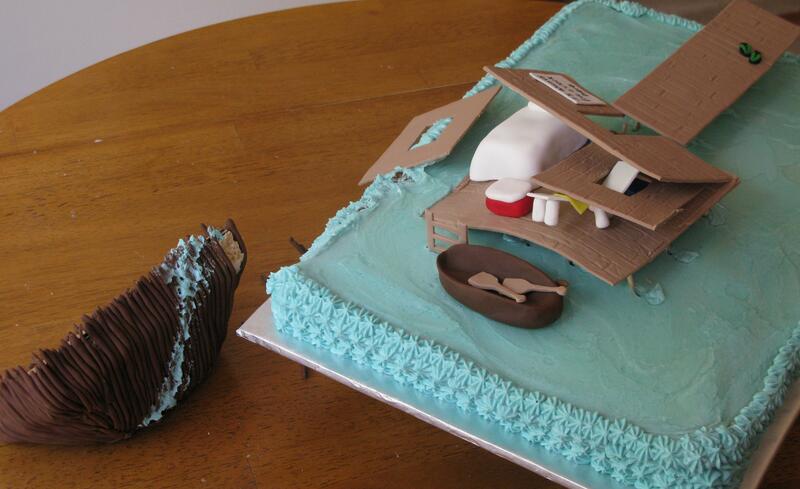 The wooden boat is made out of fondant, the paddles and ladder made out of gumpaste. Look at this setup…this really would be paradise. The flip flops and sign are made out of fondant…and I figured that sign would be perfect for the atmosphere. Leave your sandals at the door and grab a drink when you come in…well okay then! Oops!! After the pictures were taken, I had gone upstairs to get them on the computer. As I was sitting here, I heard a THUD. Oh crap, what was that? I thought. Both of my dogs were up here with me, and I knew that it had to be the cake. I creeped down the stairs and peeked around the corner…you would’ve thought I was checking for a burglar…and there it was, collapsed. I started laughing, and grabbed the camera to get pictures of the flop. As I was taking pictures of it and looking at what had happened, I knew what it was…the floor had shifted its position on top of the skewer sticks holding it up, and it couldn’t handle the weight from the walls and roof…so the floor buckled and that THUD I heard was the roof landing on top of the table. Oops again. Next time I try something like this, I’ll wrap a cake board with the textured fondant for a more stable floor, and attach the sticks to use at stilts to the bottom of the floor before inserting it into the cake. Lesson learned, but in the meantime…EPIC FAIL. Bahahaha!! I’m still laughing about it.